A glass advertising slide for Houdini's 1923 silent feature, Haldane of the Secret Service, sold on eBay today for $494.88. I expected this one to fetch a nice price and I wasn't wrong (it received 19 bids). These types of glass slides were projected on movie screens in-between shows and were one of the earliest forms of in-theater advertising. The image on this slide intrigues me as it's unlike any other Haldane adverting I've ever seen. It's certainly not a scene from the film, so it was probably not made specifically for this ad. As some Haldane advertising mixed images from past Houdini promotional material (example here), might this be an image from a long lost Houdini poster? That would be cool. But the artwork looks a little more like a magazine illustration than anything ever used on a Houdini poster. Still, it's a beauty, and I expect someone is a happy collector today. 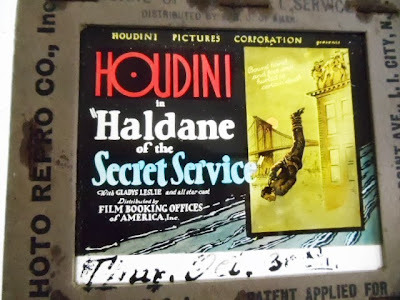 Speaking of Haldane of the Secret Service advertising, our friend Kevin Connolly recently teased on his blog Houdini Himself that he has a Haldane of the Secret Service pressbook. Kevin will be sharing select pages from that pressbook in the coming days.